The impact of research for implementation: one of a series of case studies. Malaria drug treatment was changing from one drug taken once a day to a combination treatment with four doses over three days. The packaging was critical: it needed to not only protect the drug from humidity and other damage in challenging environmental conditions but also be acceptable and easily understood by end users. Early studies showed poor comprehension of how to use the drug, and highlighted the risk of people not taking the correct or full course, which could lead to poor outcomes and also contribute to parasite resistance to the drug. Studies were conducted on drug packaging labels and boxes in Malawi and Tanzania in 2001, and the following year on educational materials for health workers in Tanzania. Researchers identified which specific visuals worked to explain dosing and which did not. There was a critical need to help people understand why they needed to take the full course, even when they were feeling better. Malaria is translated as “fever” in some languages, so speakers of those languages tended to believe that once the fever went away, they did not need the treatment anymore. As a result, a lot of attention was paid to how to visually represent the need to finish a course of treatment, with the parasites taking center stage in explaining the crucial WHY question (see Figure 1). The symbol of the sun was found to represent one day, so three suns meant take the pill for three days in a row. An image of a mosquito was most effectively understood when it was shown next to a person sleeping on a bed; lying on a bed did not signify the person was ill. These critical understandings informed the development of drug blister packs with drawings so that even someone who could not read could understand the dosing instructions. Color-coding helped to differentiate the treatment course required for different body weights. Today, the use of blister packs with illustrative instructions continues (see Figure 2). New drug versions, such as (in 2007) formulations that can be dissolved in water for children, have undergone further packaging design and comprehension testing. 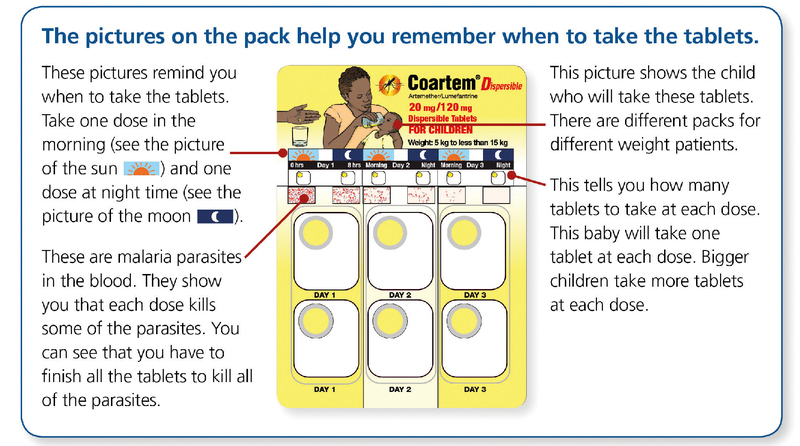 This packaging won the 2009 Pharmaceutical Patient-friendly Packaging Design Award “for an innovative solution for what might appear to be a complex unsolvable problem.” It has increased the number of people choosing to adhere to the full treatment course, thereby reducing the risk of the parasites developing drug resistance. This type of research for implementation has redefined treatment strategies for uncomplicated malaria in areas where health care access is poor. It has also allowed for expanded community case management programs by empowering community workers and, most of all, mothers and caregivers, to competently and safely administer lifesaving treatment to children. The Special Programme for Research and Training in Tropical Diseases based at the World Health Organization initiated the pretesting in 2001. The research was planned and implemented by Ane Haaland, in cooperation with the ministries of health in Kenya, Malawi, Tanzania, and Uganda; Ifakara Health Research and Development Centre in Tanzania; KEMRI Wellcome Trust Research Programme in Kenya; Child Health and Development Centre at Makerere University, Uganda; and the Institute of General Practice and Community Medicine, University of Oslo. The studies were funded by the pharmaceutical company Novartis and by Medicines for Malaria Venture.